Spare Parts Sunday: Paging Pillarless Coupe! A few weeks ago I got some old, beaten up 1/18's from my mechanic Lothar he was gonna throw away. As I knew Philipilihp was trying some custom 1/18s I took ‘m home, to see if I could get some parts for him to use as there’s a box going to Springfield anyway. 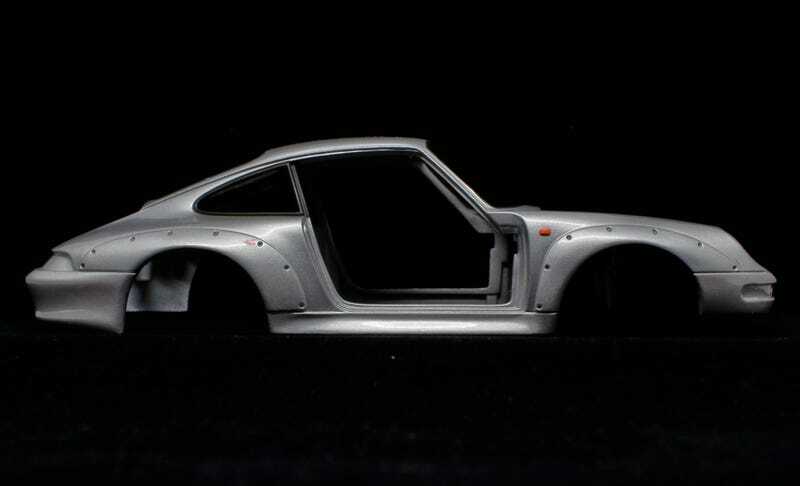 In Philipilihp’s discussions on his Porsche 959 post last Tuetonic Tuesday Pillarless Coupe asked, “for a friend”, if he could get the wheels, engine cover and front spoiler. Teutonic Tuesday: Tage des 959&apos;s geht weiter (und kleiner)! As I said: wheels, wings and spoilers are taken. The window on the passenger side door has turned milky, I presume due to some UV from standing in Lothar’s shop. Philip was interested in the engine but I’m not sure if that’s a piece he can use as it’s just a huge intercooler covering a fan, a belt and some tubes. But if you want it: it’s your Philip! That’s it, no Spaghetti from me today, I’m sorry. And remember: 917 day next Tuesday. Another Porsche. YAY!